OMD’s history is marked not only by some classic records, but also some classic designs. The sleeves for releases such as Architecture & Morality , Souvenir , Maid Of Orleans and Dazzle Ships are iconic designs that have helped to craft the style and image of the band and remain as impressive visual artefacts. 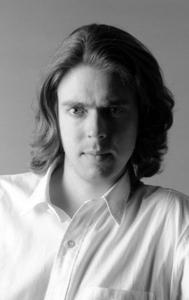 Although Peter Saville is the designer who is most closely associated with the design of many of OMD’s early record sleeves, the involvement of designers such as BRETT WICKENS has left a lasting impact on the image of the band – especially on the releases mentioned above. 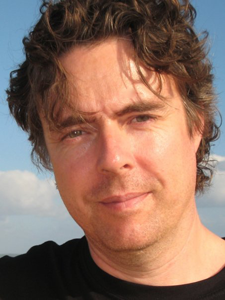 Wickens is also a musician as well as a designer, notably as part of Ceramic Hello, and is probably best known in OMD circles for involving Andy McCluskey on the song Sampling The Blast Furnace. Why did you originally decide to embark on a design career? I was always interested in both art and architecture in high school, and I very nearly went to study Architecture at York University in Toronto. However, I was accepted into the Ontario College of Art – which was hard to get in to – so I decided to go there. I had no idea where it would lead. I knew I was interested in typography and ‘commercial art’ but I really had no notion I could make a living at it. Concurrently I was inspired by a lot of the album sleeves that I saw at the Record Peddler, an import record shop in Toronto. I reacted viscerally to sleeves that I though were somehow capturing the zeitgeist and moving the needle of expectations at the same time. It was only after buying several of these records that I realized Peter Saville had designed them all. Can you talk a little about working with Peter Saville and Trevor Key as Peter Saville Associates back in the early 80s? It’s almost impossible to recount so many years of working alongside Peter and Trevor. Peter was a terrific mentor to me – a learning experience that far exceeded any formal education. Trevor was delightful to work with. All three of us practically lived together for years in the studio, day and night, pushing boundaries in all sorts of self-indulgent directions. I miss working with Peter regularly (we still collaborate from time to time). I was deeply saddened by Trevor’s death and still fondly remember him as a kind and generous friend. What were your thoughts on OMD’s music during that early 80s period? I loved OMD even before moving to England and working with Peter. At the time I moved, Organisation had just come out. It was extremely moving. I used to listen to it driving in the dark a lot. I was, of course, initially inspired by their first Factory single (and it’s beautiful sleeve), ‘Electricity’ . What do you recall about the design process for the Architecture & Morality album? I remember it being about a lot of things we were interested in at the time. First, there was the reference to David Watkins famous book; the colour schemes were highly evocative of art movements like The Circle, and we had surrounded ourselves with mid-century iconic furniture like Corbusier and Aalto! We were very interested to introduce structure into the sleeve, hence the square cut out that revealed the liner photograph. The liner could be reversed to reveal a different photograph. The photos came from my friend Robin Roddey in Canada. 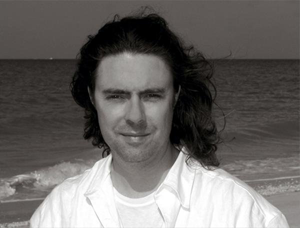 After he graduated from the Ontario College of Art, he became a forensic photographer with the Toronto Police Department. Now he is a lawyer high up in the Canadian government! Dazzle Ships is considered OMD’s best creative moment or worst commercial decision depending on who you speak to. The design is striking regardless. What are your thoughts on the design of the album and your thoughts (if any) on the content of the album? I really don’t like either. I really like original Wadsworth’s paintings of Dazzle Ships, but I felt the design was overblown, and involved way too many designers. There are some formal details that I feel should have been edited more. As for the music, I haven’t listened to it for probably 15 years, but I recall not liking it much. It’s cool to be experimental, but for me OMD are at their best writing real songs and real melodies. At chronological extremes of successful electronic music experimentation lie some incredible artists like Ralf and Florian, or Autechre. I really didn’t feel like OMD fit into that spectrum. Is there any particular OMD sleeve design that you think stands out from the others? Probably Organisation , even though it had just been designed when I met up with Peter. As Peter tells it, the sleeve was kind of a rush, and I am not sure that he was happy with it. But in the state of mind I was in at the time, and the music that accompanied it, it resonated with me. Sometimes emotions simply trump formal execution. Do you have any particular favourite OMD songs? ‘Stanlow’ , ‘Statues’ , ‘Electricity’ and ‘Souvenir’ are my favourites. I even heard a weird version of ‘Souvenir’ remixed (unofficially I think) by Moby which was incredible. 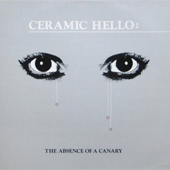 How did Ceramic Hello develop and how did Andy McCluskey become involved? http://en.wikipedia.org/wiki/Ceramic_Hello …explains most of it. After releasing the first LP, I moved to England. I was in a privileged position where I had access to people like Andy and Jah Wobble and William Orbit, who became friends, and they would listen to my demos. I was working in William’s studio on a follow up Ceramic Hello LP, and Andy heard the demo of ‘Sampling the Blast Furnace’ and immediately asked if he could help re-write, re-engineer it with me. So, at great cost to Island Music, we went into a big recording studio, which I hated, and made a wall of sound version of it, produced by Andy and William Orbit. I never liked it as much as the demo, which I made on an 8 track machine with a few friends cleverly supplying the ‘Carminia Burana’ type stuff in the background. What’s in the future for Ceramic Hello? Roger Humphreys, the other half of Ceramic Hello is now living in England and we plan to collaborate via the internet to create the third album (The second album, The Absence of a Canary v1.1 was released in 2006 by a German label as a double LP with the second disc consisting of all demo materials from the very early 1980s). The working title for the new LP is ‘Daisy Cutter’. My studio here in California will be finished being built next month so I can get down to some serious writing. I have most it thematically mapped out. I think Ceramic Hello fans will not immediately understand it because I am focusing a lot more on things that matter to me as a man in his 40s, than the dark electronic rumbles of the first album which I recorded when I was 19! Are there any current designers – or design trends – that you admire? Funnily enough I find most things I see to be derivatives of stuff that Peter and I and our associates pioneered 10, 20, 25 years ago. Everything seems appropriated. And now, I even see appropriations of appropriations. I am far more interested in artists and photographers. I particularly like the work of Keith Cottingham, Todd Hido, Larry Sultan, David Weightman and Jeff Brouws. I also keep and eye on sites like showstudio.com and lumas.com to see what’s going on. What bands or artists do you currently have a liking for?